Wow, that is a REALLY big ice machine. 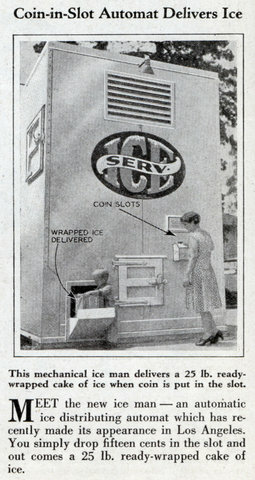 MEET the new ice man â€” an automatic ice distributing automat which has recently made its appearance in Los Angeles. You simply drop fifteen cents in the slot and out comes a 25 lb. ready-wrapped cake of ice.